We just put up 27 new Ganesh – (Ganesha) elephant amulets at the main Thai amulet store. Ganesh is a god that gets a lot of interest in Thailand and India as well as other countries that practice Buddhism and Hinduism. Ganesh is the elephant that you’ve probably seen as amulets before. Thailand Buddhists temples sometimes carry this Hindu God of Obstacles, Ganesh, in a variety of amulets because Thais really love him. Ganesh has the power to remove and place obstacles from your path. If you fear problems with completing something – you ask Ganesh to remove the obstacle for you – and, as the legend goes – your life goes a whole lot more smoothly. 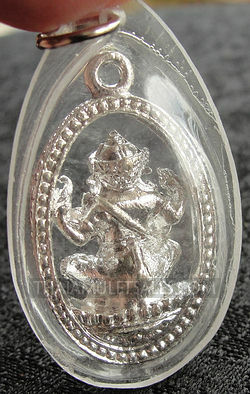 The Ganesh amulets we have are gold, white pearl colored, silver, and with gold cases or waterproof clear plastic cases. 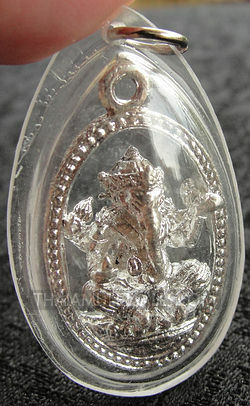 See our lovely 27 Ganesh – Ganesha amulets at our main sales site, ThaiAmuletSales.com. Author Joy BPosted on April 10, 2010 February 23, 2019 Categories GaneshTags ganesh amulet, ganesh elephant, ganesh talisman, ganesha, ganesha amulet, hindu godLeave a comment on 27 New Ganesh – Ganesha Amulets! Ganesh is the elephant that is often found in Buddhist temple amulets in Thailand and India. Ganesh is probably the ultimate – and most revered and respected Hindu god of all of them. Genesh represents the oldest son of Lord Shiva the destroyer. Ganesh’s mother is Parvati – the god of wisdom and learning and the one that removes obstacles from the paths of seekers of the truth. Before doing anything important a prayer is offered to Ganesh to ensure success. The Ganesh figure is roundish with an elephant head, 4 human arms and a tusk that has been broken. Usually Ganesh is seated and has one of his legs folded underneath. In three hands Ganesh holds some tools that are instrumental in enlightenment: Rope, axe, bowl of rice. The axe is representative of a follower needing to cut the attachments to the world in order to further mind along the path to enlightenment. The rice bowl is said to be the quenching or reward one receives as living within the enlightened state full of wisdom, truth, and intrinsic happiness. In Ganesh’s last hand is nothing… the hand appears to be giving a blessing. Parvati, his mother (or, creator) was said to be bathing and needed someone to stand guard against anyone that may enter. She created a boy for the task. When Shiva returned to where Parvati was bathing he was angry with the boy for blocking his entrance and chopped off his head with his sword. Parvati was horrified. Shiva tried to make amends and promised to put the head of a beast on instead – and found an elephant head. Parvati was still not all that happy and Shiva declared that before anyone did ANYTHING they should ask for Ganesh’s blessing on the undertaking.